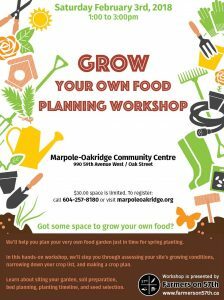 Join Farmers on 57th at Marpole Oakridge Community Centre for this beginner’s workshop on how to plan your food garden. We’ll help you assess your growing space and develop a crop list. You’ll walk away with a plan for the growing season ahead. Register now!